When it comes to food, you almost can’t resist this idea, right? Well, working out or losing weight does not matter at all because food always comes first. Today, we’re going to take a look at 5 Street Food destination in Thailand with great atmospheres and delicious cuisine. Let’s make a list. It’s the place that can truly be called “Food Land”. Victory monument is always crowded since it is the center of mass transportations. There was even a saying in Thai, “Every road leads to Victory Monument”. Of course, this assemble point must be packed with delicacy right? You can fill your tummy with a wide range of cuisine, from sweet to savory in the alleys and streets. How can we miss this one?! This area is loved by both Thai people and foreigners because it is packed with yummy food. If you have never been to Yaowarat, well, you’re out. It has savory cuisine, fruits, smoothie, and desserts – all you can taste while strolling around. It is surely a treasure for food hunters indeed. Rolling away from Yaowarat, you will find a quieter district like Dusit. Take Nakornchaisri Road and it leads you to the 2 oldest markets in town. Ratchawat Market is filled with food on both sides of the boulevard. 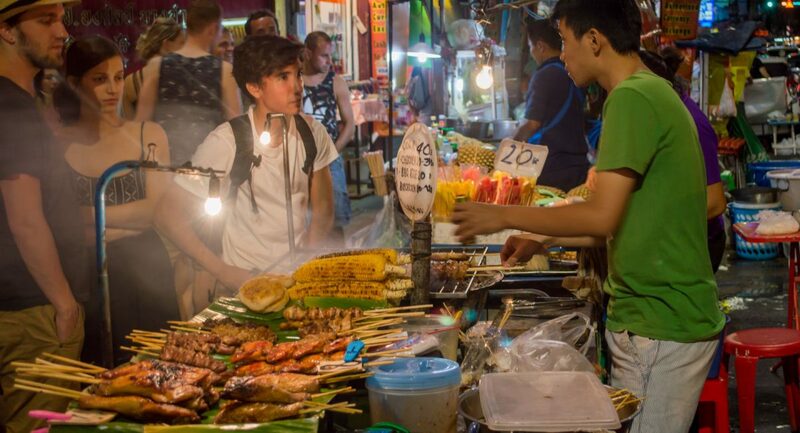 Keep going for a little bit, you will see Sri Yan Market that is rich in good quality cuisines, both for the market zone and the street food zone. Another famous foodie destination that conquers any ideas of getting fat. You might tell your friend, “I’m gonna get fat and nothing’s gonna stop me cause there’s a lot of food here.” Once you walk through Charoenkrung street to every corner and alley, you will see fatty grilled pork, sweet-scented noodle soup, roast duck, and fresh fruits as well as vegan restaurants. Well, Charoenkrung has every sort of cuisine gathered here. 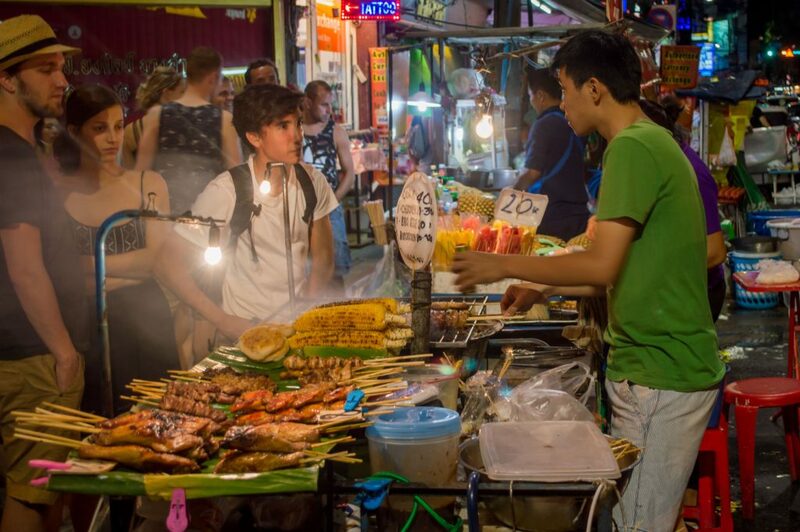 A traditional street food destination that stems from Wongwien Yai. It is packed with international cuisines and a wide range of food options – many restaurants are guaranteed by awards and certifications. Take this auntie’s old-school Vietnamese stuffed crispy omelets place for example. She placed all her pictures and prizes on the electric post. Why waste more time? Come here at once! Well, those foodie destinations make you feel like you wanna go there and grab something to eat right away? Strolling around while eating food seems to be the idea you can’t resist. Forget about getting fat, it is time for food here!